This is a typical dry coffee stout for sure. 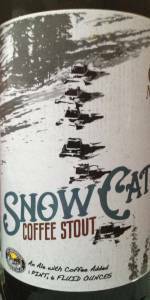 If you like your stouts that way, this will work nicely for you. I can do these once in a while, but I find myself reaching more for the big imperial stouts these days. This one's very dry, but they use coffee from a local place in the beer, so that's worth some bonus points. I didn't experience the overly carbonated version of this one that other reviewers have, so it looks like that problem got fixed. This poured with a lot of foam and had a lot of carbonation flavor-I suspect that this was a bad batch or expired (?). The beer I had was not good. The appearance was a nice looking dark brown close to black color with a substantial off white foamy head that slid off at a mild pace. Slight lace ran around the glass fairly nice. The aroma had a nice blend of sweet and roasty coffee rolling into some creamy portions and coming off somewhat like vanilla. A little wafer on the back end. The flavor was moderately sweet with a nice roasty coffee character making a good play here to balance it all out. The aftertaste was moderately sweet with a creamy coffee sort of mentality to this part. The mouthfeel was about medium bodied with a fair balance between sessionable to sipping quality. I couldn't gulp this but I couldn't sip it (at least not for too long). Finish was fairly roasty with a substantial cling but not cloying hitting against my tongue. Overall, it's a pretty good American stout packing in all of the points an American stout is supposed to. Poured from a 12oz. bottle into a tulip glass. Look- This beer looks great, dark, rich head, however, not sure if this is specific to the bottling I purchased, but the beer was carbonated almost to the point of irritation, I had to pour this beer extremely slowly, even then, foam was running over the top of my 16oz. glass. Aside from that frustration, the beer looks great. Smell- Pretty basic, coffee with hints of vanilla, a bit of creaminess as well. Taste- Again, this could be unique to the particular bottling I got, but the carbonation takes over pretty much everything else going on with this beer. The taste past the carbonation is good, mostly coffee, a bit sour however, somewhat similar to coffee which has been left sitting a bit too long. This may be due to the huge amounts of carbonation in the beer I've tasted however, the sourness is similar to that of Pelligrino water, sort of bitter as well. Overall- I almost feel as though I'm being hard on this beer, every other beer I've had from Crazy Mountain has been wonderful, this one just missed the mark for me, mostly due to the enormous amount of carbonation present in the beer. This could be due to a flaw in the brewing process of this particular batch however, so I would love to try this beer again in a month or so and possibly do a follow up review if my experience changes noticeably. Overall I would say this is a decent coffee stout which could be excellent if the carbonation weren't such an issue for me. Poured into a soccerball-shaped glass, kinda like an Irish pint glass. Look: Midnight black with a light cream colored head that recedes to a fine film. Nice spots and squiggles of soapy lacing. Aroma: Subtle milk chocolate and tons of dark roasted coffee, burnt malts. Taste: Very dark bitter coffee roast with charred, blackened toast. Overall: True to style, as advertised. Very darkly roasted -- almost too bitter. Almost. A: The beer is jet black in color and poured with a short dark beige head that died down, leaving lacing on the surface and a narrow collar around the edge of the glass. S: Light to moderate aromas of dark roasted coffee beans are present in the nose. T: The taste follows the smell and is dominated by lots of flavors of dark and roasted coffee beans, which continue through the finish and linger in to the aftertaste; only faint bits of malts are perceptible. There is a slight amount of bitterness. M: It feels a bit shy of being medium-bodied on the palate and has slightly thin with a moderate amount of carbonation. O: This beer is a little thin and light in body for a stout but makes for a good breakfast beer with all of the coffee aromas and flavors. Mouthfeel/Taste: Smooth full bodied. Taste of coffee and hint of chocolate with malts. Overall: Good stout, taste like I'm just drinking a coffee.